There has been a bit of a delay in posting photos, as my camera broke. But a new one has been obtained, so onward with the photos. These were part of my 7th submission to the Painting Challenge. I have been waiting for these figures for some time now, I knew they would be good and I can say they are fantastic. 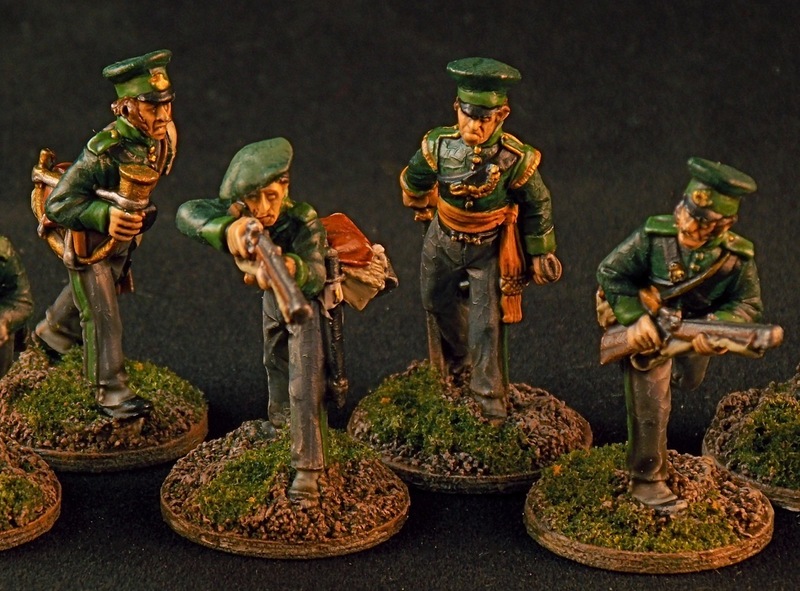 They are of course from Westfalia Miniatures, and they complete my 1st Hanoverian Brigade at Waterloo. There were two companies at Waterloo and were under the command of Hauptman von Reden. They are based individually on 20 mm round bases which is a new step for me in Napoleonic basing. Four figures represent a company. 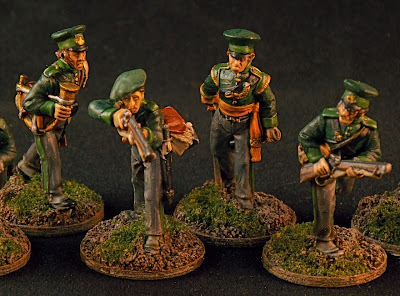 I recently polled my readers for recommendations on how to base figures which I would only ever use as skirmishers. Generally advice broke into two camps: 2 figures on large bases with little dioramas or single basing. I have always wanted to have a go at Sharp Practice from Too Fat Lardies, but have never had any single based Napoleonics, so I said I would give it a go. Once I get a little more comfortable with the camera, I will post some action photos of the whole brigade. I think Kawe is justified in posting these on his gallery; they're very nice! Excellent job John on some great minis! They really are very nice figures - great detail. You've done a very nice job painting and basing them too. I really like them, great figures! They are lovely figures and you have brought them to life with your painting, superb.